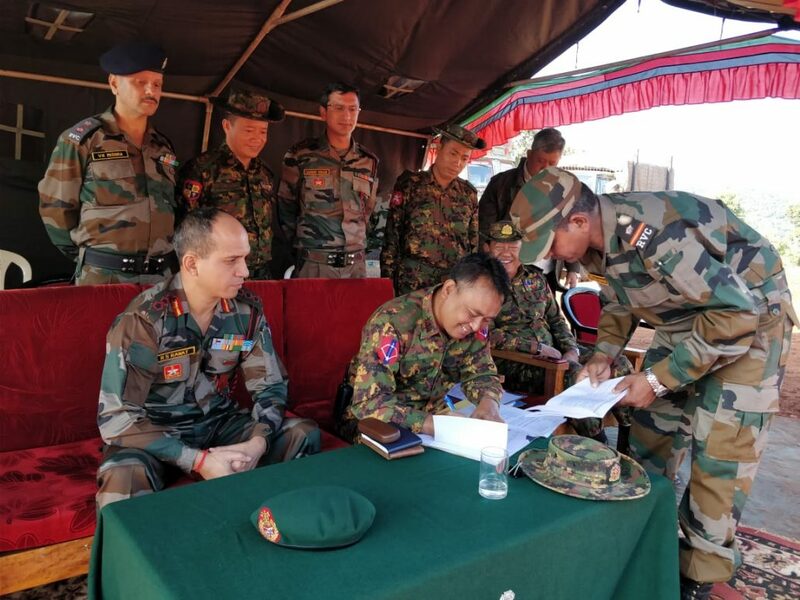 In a move to strengthen bilateral relations between India and Myanmar, 15 trained horses were handed over by Indian Army to Myanmar Army in a grand function organised at the Moreh, the commercial town in Manipur bordering Myanmar’s Saigang region on Thursday. The grand handing taking over ceremony organized by 26 Sector Assam Rifles under the aegis of Inspector General of Assam Rifles (South). “The event was made more special since it coincided with the auspicious occasion of Dusshera. The trained ceremonial horses are being provided on sale to Myanmar Army in furtherance of defence foreign co-operation measures,” said a PRO of Assam Rifles (South) in a press release. “Indian Army in the past had gifted fifteen ceremonial horses and fifteen sniffer dogs to Myanmar Army in the month of March and May 2017,” he said. The Horses have been bred, reared and trained at Remount Training School and Depot, Remount Veterinary Corps establishment at Hempur, Uttarakhand which has got rich experience of 240 years of breeding and training of horses, mules and dogs for the Indian Army and friendly foreign countries, the release said. The horses started their road journey from Hempur, Uttarakhand on October 6 and reached Moreh on October 17 after travelling a distance of 2500 km over a period of 11 days. These horses were personally selected from amongst more than 3000 horses at Remount Training School and Depot, Hempur by Myanmar delegation during their visit to the establishment in the month of September 2018. The Indian delegation was led by Commandant 11 Assam Rifles Colonel RS Rawat, Officer Commanding 3 Army Dog Unit Lt Colonel VK Mishra, Town Commander, Moreh Major Animesh Tripathi, and other staff officers were also present, it said. On the other hand, the Myanmar delegation was led by Col Nyi Nyi Tin, 2ndCommanding Officer, RCC, Kalemyo.